When WSET-educated wine lovers Robin and Brian Christensen set out to start a winery in Santa Ana, California, they realized that something was missing from their city: spirits. 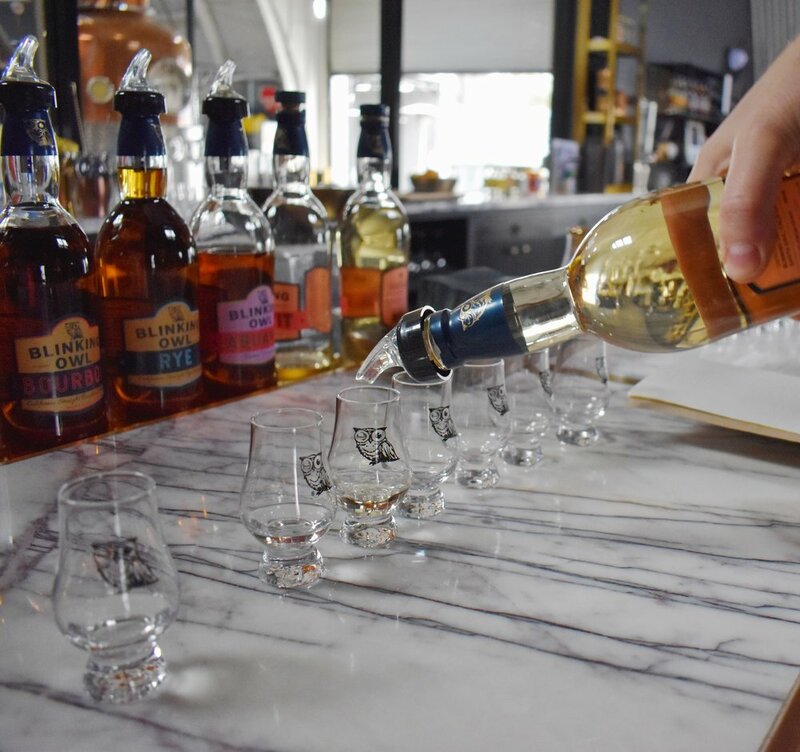 In fact, no one was distilling between San Diego and Los Angeles, and since the Christensen had a pre-Prohibition distilling history, the Blinking Owl Distillery was born. The name pays tribute to Santa Ana’s famous, now defunct dive bar of the same name. Instead of a dark beer hole, the community is beginning to gather around Blinking Owl’s hybrid pot/column still and taste cocktails crafted specifically to feature the spirits at their still-to-shaker bar. The distillery’s mission has been to develop a more terroir-driven spirit. All of the grain used for their products is organically grown in California. Their barley is malted by Admiral Maltings, California’s first craft malthouse. Using malted barley from a small, in-state malthouse is still a relatively new practice for craft brewers, but it’s really progressive for a distillery to take such a hyperlocal approach. Much of the rest is done in-house, from milling to filling the bottles four at a time. Distiller Ryan Friesen started his distilling career with the Journeyman Distillery in Michigan before being recruited by the Christensens to launch Blinking Owl. Aside from selecting local grain, the best way to ensure that a spirit has a unique local expression is to begin with the local water, which he uses in all the spirits. Santa Ana is far from a pristine mountain town, but against odds, with its looming water tower downtown, it has twice been awarded the best municipal water in the U.S. by the Berkeley Springs Water Tasting, the world’s largest water competition. Understanding what makes water taste good may be more complicated than a chemical analysis. Distillers measure the pH and mineral content, but tasters only rely on perception. Professional water tasters tend to look for water that has no aroma and a clean, short finish. Essentially they look for the opposite of what a wine taster seeks. Water that performs well in taste tests tends to have low to moderate minerality and a neutral pH. Santa Ana’s water is noticeably cleaner tasting than nearby Los Angeles’ because the city sits atop an aquifer. Rather than having to use ducts to bring their water from other parts of the state, Santa Ana is able to extract much of their own water from the ground. Over tapping the aquifer would cause the city to actually sink, so they balance groundwater with water from other parts of the state. So really what makes Santa Ana’s water so good, has almost as much to do with keen engineering as it does with natural water sources. The distillery completely filters the water that they dilute their spirits with, but the water that they mash with requires little adjustment because it has such a clean local character. California grain and local groundwater paired with doing all of the production work in-house give Blinking Owl Spirits a character that is uniquely Californian, uniquely Santa Anan even. Like many craft distilleries, the first products that were launched were vodkas and botanical spirits as their brown spirits had a chance to mature. Their base spirit is made with mostly wheat, but a bit of malted barley rounds out the texture. It’s only coarsely filtered, which allows for retention of the aromas and the grain spirit. Because of the distillery’s commitment to local character, they knew that an orange vodka was necessary. Aside from the county being named after oranges, the area was once full of orange groves, and many houses still keep their own pet orange tree. Blinking Owl gets all of the oranges for their OC Vodka from the Orange County Heritage Museum’s on-site grove. The process of infusion is unusual. Whole oranges are cut and steeped in the still as the spirit is vaporized. This makes for a vodka that doesn’t have any sweetness, but that has a complete orange flavor, bitter pith and all. A sip of the vodka conjures the flavor of over-enthusiastically biting an orange wedge garnish. More unusual than vodka and gin is the aquavit. The distillery makes it to pay tribute to the Christensen family’s Scandinavian heritage. Perhaps the most unusual thing we tasted from Blinking Owl was a “Barrel Vacationed” Aquavit, which spent nine months in barrels that were previously used to age late harvest Napa Semillon from the Dolce Winery. The caraway was somewhat neutralized by the raisin flavors of the late-harvest wine. As for the whiskey, the first ones have come out of barrel and shown great promise of the city’s award-winning water. While the provocative flavors of the spirits at Blinking Owl stir the imagination towards cocktails, their expressiveness and purity leave us wanting to keep tasting them neat. Oddly enough, we kept coming back to the plain old vodka. It is in this crystal spirit that the organic wheat and award-winning water are appreciated without distractions. Because Blinking Owl is Orange County’s first distillery, they rely on community excitement to support the project and bring people together. The MBA (Make, Barrel, Age) program allows anyone to co-create a barrel of whiskey with Ryan at the distillery. The Parliament Club is something like a wine club, it allows the community to get first access to new releases from the young distillery’s evolving barrel program. After all, rather than being a factory, this distillery is part of the community.